With almost 3000 years worth of history and culture on display, Rome is a cosmopolitan city the likes of which aren't many. Officially labeled a special comune of Italy, Rome is spread over a total area of 1,285 km² and if that seems small to you, wait till you hear about everything the city is home to! From the majestic Colosseum and Roman Forum to the iconic St. Peter's Basilica and the Vatican Museums, Rome is chock full of places to see and experiences to be had. Add to that the fact that Rome also houses the headquarter of the Roman Catholic Church, the Vatican City and you have a city that'll keep you truly busy. 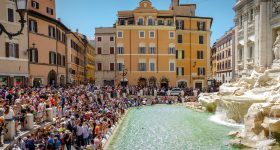 Rome attracts a crowd of over 10 million people annually - what that'll mean for your experience in the city is long queues that can last up to three hours on a weekend! If you're wondering if there's a way yo avoid the queue so that you save time and use that to actually explore the city, fear not. Our collection of skip the line tickets for Rome attractions is exactly what you need. One of the highlights of Rome is the collection of museums housed within the Vatican, collectively labeled the Vatican Museums. Like the name suggests, these museums are located within the Vatican City and also include the famed Sistine Chapel. Since the Sistine Chapel is housed within the Vatican Museums, you don't need a separate ticket for it. The Vatican Museums attract a crowd of over 6 million annually and gets extremely busy during the afternoon. To avoid the incessant queues at the entrance, you can opt for skip the line Vatican Museum tickets that allow you priority access to the museum. Read on to discover what other factors are involved in making your trip to the Vatican Museums as hassle free as possible. The queue at the Vatican Museums entrance. To make the inflow of visitors more streamlined, the management of the Vatican Museums follow a 3 queue system. The first queue is for visitors who haven't purchased their tickets in advance and want to buy them on the spot. The second queue is for folks who have purchased their tickets online and the third and final queue is a special entry for group tours. It's safe to say that the first queue is the longest and by buying your tickets online you can move to the second queue, which moves much faster. Depending on the time and season you plan on visiting the Vatican Museums, you can save anywhere between 30 minutes to one hour by booking your tickets online. The special third queue we mentioned previously comes to play for guided tours. To avoid confusion at the entrance of the museum, the guided tour groups are provided with priority access. While a guided tour would cost a little more than your regular tour, it's definitely worth the price of admission. When you buy your Vatican Museums ticket online at Headout, you can choose from a wide range of guided tour options, all of which give you priority access to the museum through the third queue. If you still considering your options, another reason why you should opt for a guided tour is that the third queue is the shortest of all three by a wide margin. Since the museums remain closed on Sunday and Monday, most of the crowd flocks to the attraction on Friday and Saturday. One simple way to avoid the crowds is by visiting the museums anytime during Monday to Thursday from 12:00 to 18:00. If you're planning on visiting the museum during the latter half of the day, please note that some of the rooms in the museum start closing at 17:30. Another thing of note is that entry to the Vatican Museums is free on the last Sunday of every month but since the entry is free, you can expect almost double the crowd. If you wish to experience the Vatican Museums in relative solitude, Headout offers a guided tour that allows you to enter the museum one hour before it opens for the general public. The Papal Basilica of St. Peter in the Vatican, also called St. Peter's Basilica is a beautiful Italian Renaissance church that attracts massive crowds throughout the year. St. Peter's Basilica holds the official title of being the largest church in the world and also happens to be the most famous work of Renaissance architecture. Entry to the church is free and given the fact that the church is revered by Christians across the globe, you can expect hours long queues at the entrance. While there are no direct skip the line tickets for the church, we have put together a few hacks that'll allow you to bypass the waiting queue and directly enter the church. The queue at the entrance of St. Peter's Basilica. One of the simplest ways of skipping the queue at St. Peter's Basilica is by opting for a complete Vatican Museums tour. Confused? Well, given the close proximity, most tours of the Vatican Museums end at St. Peter's Basilica. What's especially convenient is that folks that are a part of these group tours get to the access the basilica through a special dedicated entrance, thus avoiding the main entrance queue. 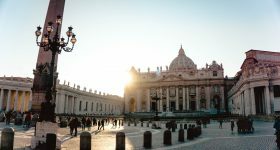 If you're really interested in learning more about St. Peter's Basilica and have already visited the Vatican Museums, you can opt for a guided tour of the church. This not only adds to your overall experience of the place but also provides you access to the church via a special gate. Avoid the serpentine queue outside St. Peter's Basilica by opting for an educational guided tour of the church. Next up on your fabulous Roman tour should be the collective delights of the Colosseum, Roman Forum and Palatine Hill. The Colosseum, also called Flavian Amphitheatre, is an iconic historic monument located in the centre of Rome. Next to the Colosseum is the equally mesmerizing Roman Forum - an archaeological complex housing the remnants of grand palaces, temples, arches and more. Completing the historic trio of landmarks is the Palatine Hill. The centremost of the Seven Hills of Rome, the Palatine overlooks the Roman Forum and the Circus Maximus on either side. The great thing about this collection of experiences is that most tickets for the Colosseum also give you access to the Roman Forum and Palatine Hill. 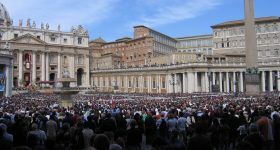 The three are also one of the most popular tourist destinations in Rome and attract a considerable amount of crowd round the year, leading to massive queues at the entrance. Here's how you can skip these pesky queues and walk straight in to experience the historical marvel awaiting you. The queue waiting to enter at the Colosseum. Following the same concept as the Vatican Museums, the Colosseum also allows visitors in through two separate queues. The first queue is for visitors who have not purchased their tickets previously and looking to buy them on the spot. The second queue is for visitors who have booked their tickets online and happens to be considerably shorter than the first one. By booking your Colosseum tickets online you can save anywhere between 30 minutes to one entire hour. Most tickets to the Colosseum get you access to the Roman Forum and Palatine Hill. With these tickets, you can begin your sightseeing at the Palatine Hill entrance. This entrance is relatively quiter and lesser popular than the one at the Colosseum. Lines here rarely stretch more than 20-30 minutes. If you enter at the Palatine Hill, you will be crossing the Roman Forum before you head to the Colosseum. The Colosseum, Roman Forum & Palatine Hill complex. Highlighted route shows entry at Palatine Hill and finish at the Colosseum. The queue at the Palatine Hill entrance is relatively much shorter. Another way to skip the queue at the Colosseum is by opting for a guided tour of the attraction. A guided tour is great not only because you get to learn some interesting facts about the place you're visiting but also offers you priority access. By skipping the never ending queue at the entrance you can actually spend more time actually exploring the Colosseum and surrounding attractions. Book your Colosseum guided tour online at Headout to skip the lines and make your trip special. Housed within the former Villa Borghese Pinciana, the Borghese Gallery is a quaint museum housing some stellar pieces of art; including paintings, antiques and sculptures. Also a part of the property is the breathtaking Borghese Garden. Unlike other attractions in Rome, the Borghese Gallery follows a strict visiting policy. At a given point, only 360 visitors are allowed inside the gallery. Each day, there are five time slots when guests can visit and each time slot is for two hours. At the end of the two hours, you have to leave the museum. Due to these strict regulations and limited slots, tickets for the Borghese tend to sell out pretty quickly. If you arrive at the museum without a ticket in hand, it's very likely tickets will be sold out, in which case you will have to wait two hours, until the next time slot. In addition, even if you do get the tickets, the line is regularly quite long, since admission is done at a particular time rather than at a constant flow. Like other Roman attractions, the Borghese Gallery also has separate queues for people with and without tickets. The first queue is for people who are planning on buying the tickets at the entrance while the second queue is exclusively for visitors who have planned their trip and booked tickets online. 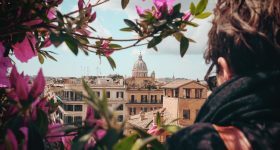 Generally, you can save around 30 to 45 minutes by booking your Borghese Gallery tickets online and entering the landmark via the second queue.